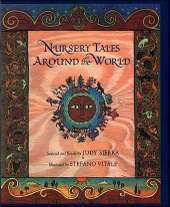 Judy Sierra, Nursery Tales Around the World. Illustrated by Stefano Vitale. Clarion, 1996. I happened upon a copy of this book while browsing through Ten Thousand Villages in Carytown a few weeks ago. Judy Sierra retells folk tales from around the world, organized into categories that highlight similarities between tales, such as "runaway cookies" and "incredible appetites." Every page has beautiful borders and illustrations by Stefano Vitale, who chose a rich, earthy palette for this book. We have been reading one story per night from the book, a treat which is eagerly anticipated at bedtime each night. Ms. Sierra links to Amazon but also provides a link to Booksense.com, a site which enables browsers to find local independent booksellers.